Summer is definitely over, so it’s time to put tomatoes in the oven. For this, I will use a stuffing similar to the one I use for aubergines, courgettes and peppers, which is my version of a bolognese sauce. By making a larger quantity, I will either freeze some or cook spaghetti tonight. 1 soup spoonful olive oil1. Cut the top third of the tomatoes and reserve. With a grapefruit knife, scoop out the inside flesh of the tomatoes and reserve. 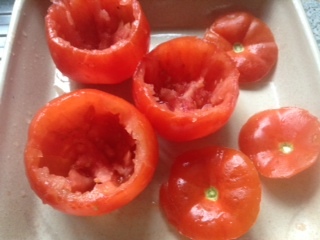 Lightly salt the inside of the tomatoes and turn them upside down in an ovenproof dish to disgorge their water. 2. Put all the other ingredients and the tomato flesh in a food mixer and whizz. 3. Gently dry fry this mixture in a non-stick frying pan, without any oil for 5 minutes. 4. 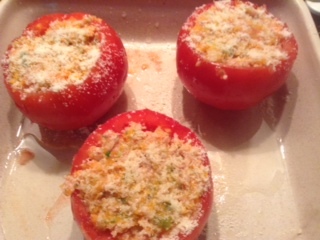 Fill the tomato shells, sprinkle the Parmesan on top and drizzle with olive oil. Place the ‘hats’ (top third of the tomatoes) and cook in a pre- heated oven at 200C for 10 minutes.Bon Appétit!Notes: For a vegetarian version, omit the bacon and use some cooked couscous instead. If you use this mixture for a pasta sauce, add a small tin of tomato purée and a dash of red wine. Lasagne and Farfalle pasta are also delicious with this sauce. These stuffed tomatoes do not freeze well because their skin is too thin. 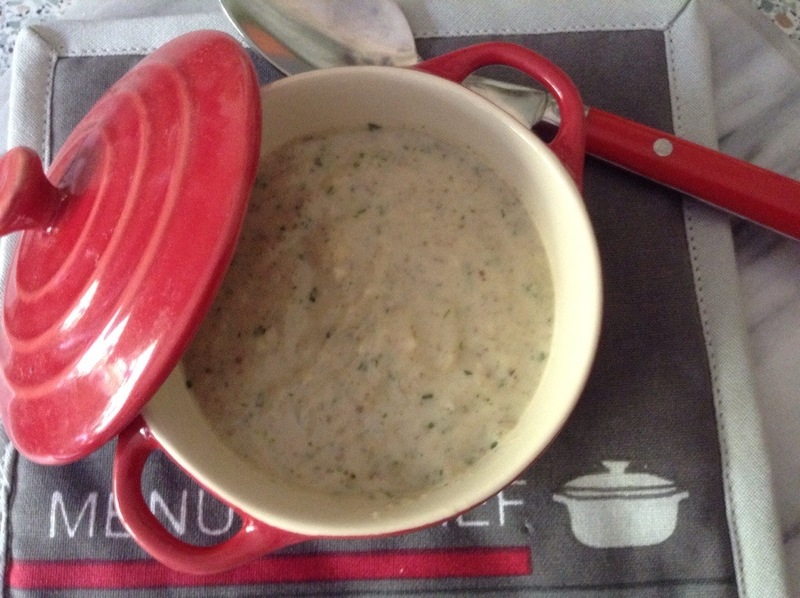 This easy starter can become a pleasing sauce if you thicken it a little. It will go very well on grilled steak, gammon, chicken or fish. It will also be delicious in lasagne. You can also use Portobello mushrooms. 1. Heat the oil in a non-stick frying pan and toss the mushrooms in it for 5 minutes over a low heat. 2. Whizz the mushrooms in a food blender with the garlic and the parsley. Reserve. 3. Melt the butter in a saucepan over a low heat. Add the cornflour slowly, stirring all the time. Pour the milk gradually, making sure to avoid lumps forming. (If they do, pour the mixture in the blender and this will get rid of the lumps). 4. Dissolve the vegetable cube in a little hot water and pour into the saucepan. 5. Finally, add the mushroom mixture, stirring well and heat over a low heat for 5 minutes.